For the benefit of those of you who also own the Tokyo Hy-Power (THP) HL-2.5KFX auto-tune HF amplifier and HC-1.5KAT ATU, here are a few notes about using them. With a potentially lethal 240 volt mains supply, the amplifier finals run at over 100 volts, under some conditions pumping several kilovolts of RF through the ATU to the antenna. RF burns are nasty enough even at 100 watts so I imagine at the kilowatt - or killer-watt - level they are more than merely painful. RF penetrates the outer layers of the skin and cooks the underlying soft tissues. If you don’t know what you’re doing, leave the lids on and don’t meddle. Even if you DO know what you’re doing, and are prepared to take the risk, pay great attention to safety as you probably won’t get a second chance. The HL-2.5KFX amp is rated at 2½ kW input, producing up to 1½ kW PEP output on all except 10m where it reaches about 1 kW flat-out. Our license limit in ZL is 1 kW so it’s ideal for us. The design was described in some detail by its proud creator, Toshiaki Ohsawa (JE1BLI), and the THP president Nobuki Wakabayashi (JA1DJW), in an excellent technical article in QEX. It uses a push-pull pair of ARF1500 MOSFETs in the output: these are about the same price as QRO HF valves. The owner’s manual is online here and there are a few notes about QSK timing etc. here. 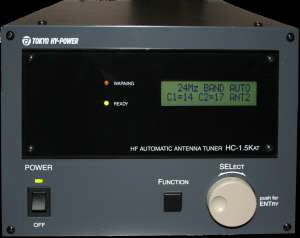 The HC-1.5KAT is an auto-tuning HF Antenna Tuning Unit rated for 1.5 kW at up to 2:1 SWR covering 160m to 10m, with a direct pass-through facility for 6m. The ATU circuit is a straightforward T-match using a pair of air variable capacitors (with additional fixed capacitors switched in parallel for the low bands) and a string of air core and toroidal core coils selected by relays. The T-match is inline for both transmit and receive, so long as the ATU is turned on. When it is switched off, the transmitter is directly connected to antenna 1 by a relay. The clever part is the control circuitry that measures the SWR on the antenna feedline and rapidly adjusts the T match to present a low-SWR load to the transmitter. It monitors the SWR continuously so long as sufficient RF is present, retunes itself if necessary and drops the PTT displaying an error message if it can’t find a match. To match more rapidly, the ATU pre-tunes itself as each band is selected (either manually from the front panel or through the data cable from a connected THP amplifier). It evidently uses factory default settings, presumably pre-defined in the firmware for its 16-bit microprocessor. 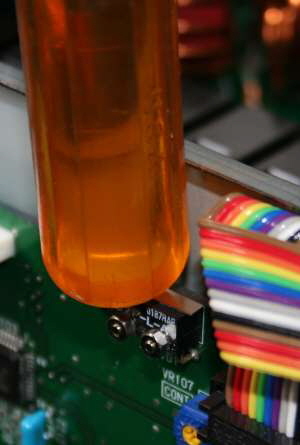 When it senses sufficient input RF to get a SWR reading (about 10-20 watts), it rapidly fine-tunes the capacitors using stepper motors and if necessary selects more/less inductance with the relays, achieving a good match within a second, usually much less if the antenna naturally presents a good match. Only then does it complete the PTT connection to key the amplifier. For some reason, the ATU doesn’t store and recall the actual settings used previously on a band instead of those factory defaults. If it did that, I wouldn’t need to switch the amp to standby, tune off a spotted DX station’s frequency to find a clear channel, send some RF to get the ATU to retune itself, then put the amp back online - all to avoid QRMing others in the pileup. The ATU would already be tuned and could quickly sense the SWR and short the PTT with hardly any delay. I know I can just start transmitting normally but for the second or so until the ATU retunes itself, the amp is offline, truncating the start of my transmission. [Please, THP designers, rewrite the firmware to store and recall previous band settings, returning to the factory defaults only if necessary]. The ATU has 3 antenna connectors, any one being automatically pre-selected for each band. It is possible to change to another antenna, or to tune the ATU manually, using the front panel function button and a turn-and-press selector knob. A 2-line LCD display gives enough of a hint to know what you are configuring although the cunning interface takes a bit of getting used to. As supplied, the ATU is surprisingly noisy due to a little 4 cm computer-type fan running flat out inside. This draws air in from a rear panel side grill, past the control boards and stepper motors, then out past the T-match coils to a rear panel top grill. As installed, the fan/chassis combination seems to resonate creating a pronounced and annoying whine around 1.5 or 2kHz, audible above the whooshing noise of the mass air flow. A US-based THP dealer has advised owners who complain about the noise to disconnect the fan. Although I have near-resonant antennas and seldom run QRO, I was concerned about the possibility of overheating the circuit boards or stepper motors in contests or when using RTTY. Somehow I doubt the designers would have put the fan in there unless it's needed under some foreseeable circumstances. So, I would rather just slow it down than stop it altogether. The fan in mine is an EUDC12B8 from Japan Servo Co, rated to supply up to 6 CFM of air flow with no back-pressure at 13.8V and 75mA or about a watt - pretty standard for a little fan. It is supposedly fairly quiet at just 30 dBA but evidently not when installed in this ATU. After cutting the fan’s red supply wire to insert a small variable resistor, I found that about 100 ohms in series with the fan substantially reduces the noise, but also of course reduces the fan speed and cooling effect. 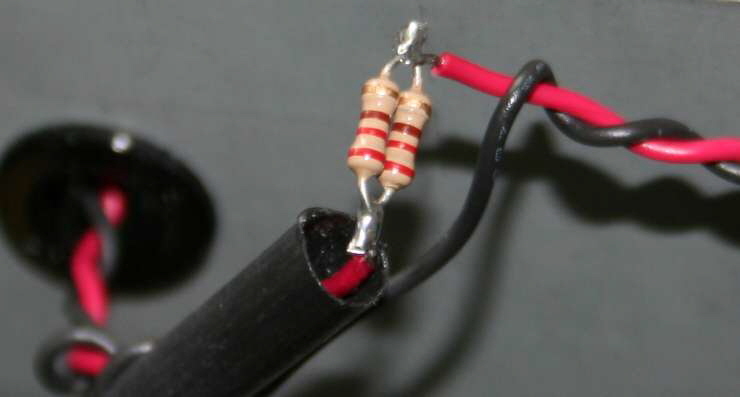 I initially tried a parallel pair of 150 ohm ¼ watt resistors which improved things, but then swapped them for a parallel pair of 220 ohm ¼ watt resistors instead, giving 110 ohms in series with the fan. This alone substantially reduces both the air noise and the whine. I used a small length of heat-shrink tubing to insulate the resistors. Just remember to slip it over the wire before soldering the resistors in place! The resistors drop about 5 volts when the fan is running normally, dissipating about ¼ watt. A single ½ watt resistor of 100 or 120 ohms would probably do nicely, whereas a single ¼ watt resistor might burn out in this application unless it was very carefully positioned in the air flow, but why take the risk? Don’t use too large a resistance value, however, as the fan may not start reliably. I also put little triangles of thin plastic padding under each corner of the fan, between the fan and the chassis panel, to help deaden the vibrations at resonance. I cut them from a bag used to protect something in the mail, and punctured holes with a probe so that they would fit over the fan’s mounting screws. By the way, although the upper fan screws are easily accessible, the lower ones took some ingenuity to loosen and tighten with a 6 mm hex screwdriver bit held in a pair of pliers. Much easier than removing the front panel or dismantling the entire chassis to get at them with a normal screwdriver! To test the fan mod with the ATU case off, you’ll have to defeat the safety interlock temporarily. It’s called a safety interlock for good reason: check that all your tools and wire clippings are well clear of the innards, double-check that you cannot transmit any RF through the ATU (turn off your transceivers), reconnect the 12 volt power cable, gently depress the safety interlock microswitch with something suitable such as the handle of a screwdriver (see left) and switch the ATU on at the front panel. The fan should start and run immediately. 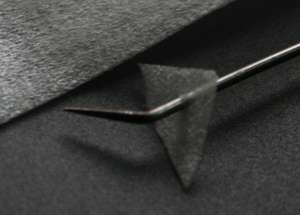 Provided you haven’t yet shrunk the heat -shrink tubing into place, it’s easy to tell the difference you’ve made by shorting out the resistors with a croc -clip lead or piece of wire. The fan is much quieter now but I'm tempted to fit a switch to short out the resistors and run the fan at full speed when I'm contesting, just so long as I’m wearing noise-cancelling headphones anyway! There's plenty of space on the front panel for a switch but it would be nice to find a source for a rectangular plastic switch to match those in the ATU and amp ... or maybe I’ll fit a miniature switch out of sight on the bottom of the case ... or maybe I’ll buy another fan to see if that helps. Who knows, maybe the original fan will become whisper-quiet once it has been fully run-in. Now I need to rearrange my desk a bit so the ATU doesn't sit right on top of the warm amp, then tackle the noisy fan in the THP amp (why does it idle so fast I wonder? )!